This is a shrine with a tough history to trace. Its former name ‘Rokushogongen’ can’t be found in the ‘Unyoushi’ of the Kyouhou Era (1716-1735).The only shrines to be seen in the Shiotsu entry are ‘Hachioji’ and ‘Ishigami Myoujin’. The latter is described as being ‘without a shrine building, Heihaku (Shinto offering) present’ sharing some shrine physiognomy with the current structure. The shrine today consists of only the ‘Haiden’(Prayer Hall), there is no main shrine building. The stone boulder inside the wall behind the Prayer Hall is wrapped with a straw rope pinning down the Heihaku shrine offering. ‘Hachioji’ refers to Funamori -jinja(the boat guardian ). It is enshrined in the West of Shiotsu-ura. The enshrined deity is Kunisatsuchi-no-mikoto, the protector of boats and the sea. Why that deity became the boat/sea protector isn’t clear, but without a doubt, that is what this deity protects. Actually, during the Edo Period, it became more widely known that Ishigami-jinja was the same ‘Umi- yashiro’ noted in the article on Tatenui Province in the Fudoki. There is detailed research on this by Izumi Rinichiro .Within the shrine grounds, there is a stone memorial dedicated to him. However in actuality, currently ‘Umi-yashiro’ is enshrined in Mi-no-machi in Hirata-cho. Furthermore, for some reason both Ishigami-jinja in Shiotsu-ura and Umi-jinja in Hirata have the same enshrined deity as Ishigami-jinja in Kama-ura: Futsunushi-no-mikoto. The old woodblocks describing the shrine refer to it as ‘Rokusho gongen’. There is no way to clarify whether the names of the 6 kami (Rokusho) in the root of the name ‘Rokusho-jinja’ came from Ishigami-jinja or perhaps Funamori-jinja. 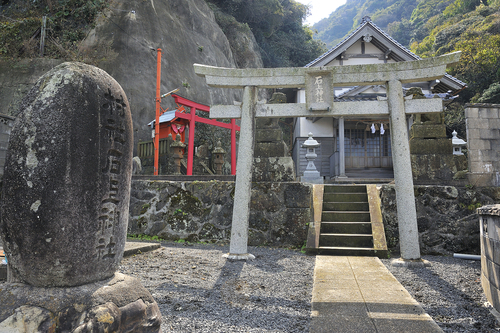 The object containing the deity in Ishigami -jinja can be found around the back of the shrine. It is a stone, placed in the middle of a wooden fence in an unroofed area with Gohei Shinto paper and a sacred tree. 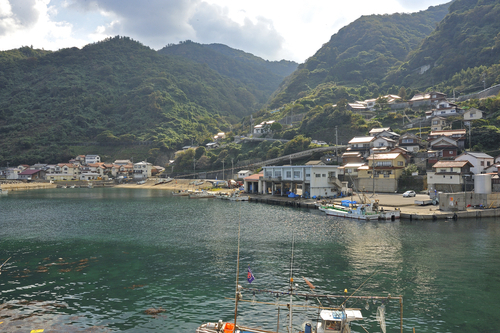 Seeing this tells us of the serious faith practiced by the townspeople of Shiotsu-Ura. The main hall of the shrine was washed away by a huge tidal wave along with residential dwellings during the Heian Period. According to the official report, the sacred stone was also submerged in the depths of the sea. This has since been pulled in and is mentioned in the shrine history plaque enshrined at Ishigami-jinja. The local people refer to it is ‘Ishigami-sama’. Compared to other shrines in the area Shiotsu-ura Ishigami -jinja is located at a relatively low level to the sea. A mere 20 stone steps, in fact. It is enshrined about 20-30 meters from the city road that passes along the coastline. Within the shrine grounds is a red Inari Shrine too. It is a shrine that leaves a lasting impression.